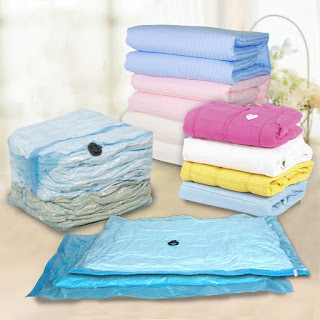 Townpeak Space Saver Bag Vacuum compression Seal Bags are amazing! My linen closet was overflowing with blankets so I thought I'd give these a try and I'm completely amazed at how much space I now have in my closet. These bags hold my comforters, sheets, pillowcases and even a full size pillow. I now have everything stored neatly in my linen closet with room to spare. They don't seem to leak and are still just as compact as the day I sealed them. I love that these can be reused and that the plastic is thick so they won't leak easily. Townpeak Space Saver Bag Vacuum compression Seal Bags are a terrific way to organize and save space in any closet.